Wish you had passive income without the liability of ownership or tenants and repairs? Learn how buying, selling, and creating mortgages has been a profitable niche of real estate for decades in the full day class. Wish you had passive income without the liability of ownership or tenants and repairs? Want to make quick cash without rehabbing? Buying, selling, and creating mortgages has been a profitable niche of real estate for decades. It’s created wealth for countless individuals and investors without ever having to own real estate. 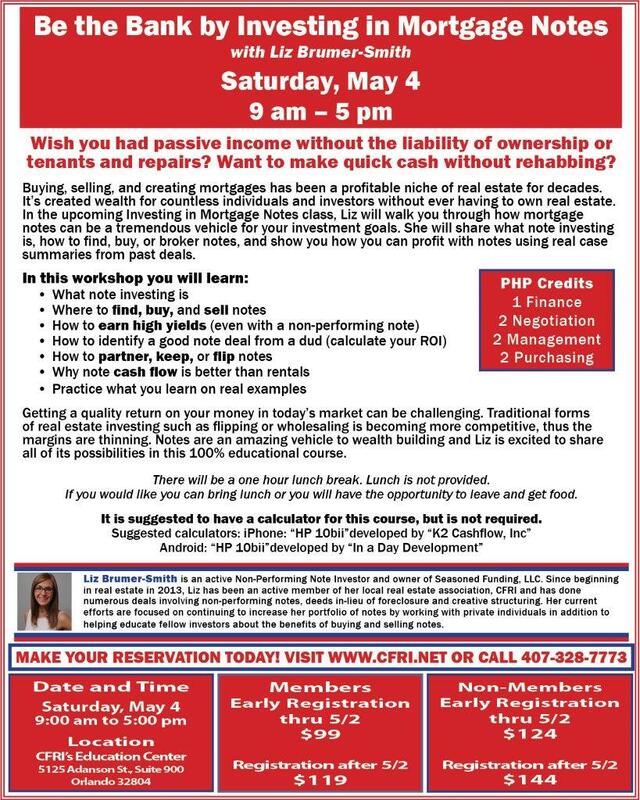 In the upcoming Investing in Mortgage Notes class, Liz will walk you through how mortgage notes can be a tremendous vehicle for your investment goals. She will share what note investing is, how to find, buy, or broker notes, and show you how you can profit with notes using real case summaries from past deals. Getting a quality return on your money in today’s market can be challenging. Traditional forms of real estate investing such as flipping or wholesaling is becoming more competitive, thus the margins are thinning. Notes are an amazing vehicle to wealth building and Liz is excited to share all of its possibilities in this 100% educational course. There will be a one hour lunch break. Lunch is not provided. If you would like you can bring lunch or you will have the opportunity to leave and get food. It is suggested to have a calculator for this course, but is not required.